Update the block diagram to assemble the model and visualize its initial configuration. The visualization opens in Mechanics Explorer. Simulate the model to play an interactive animation. 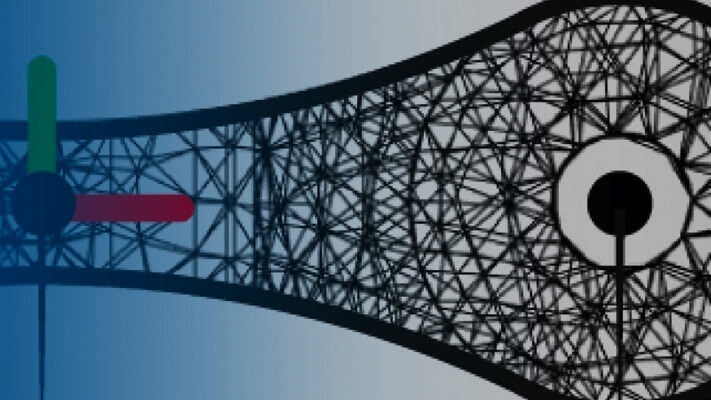 Be sure to pick a solver suited for physical models, such as Ode15s, and to specify a maximum time step small enough to capture the fastest meaningful change expected during simulation. Open Camera Manager to add a moving, dynamic camera with which to capture the animation. Dynamic cameras can be of two types: keyframed or tracking. Keyframed cameras move between view points created interactively in Mechanics Explorer. Tracking cameras attach to and aim at frames in the model. Use Video Creator or the smwritevideo function to record an animation in a video format. Use the KinematicsSolver class to create a kinematic representation of a model and formulate a kinematic problem to solve. KinematicsSolver objects contain all the joint variables available in a model. Complement them with frame variables and assign both joint and frame variables as targets, guesses, and outputs for analysis. Workflow steps for updating and simulating a Simscape™ Multibody™ model. Set the model configuration parameters to ensure that Mechanics Explorer opens automatically on model update or simulation. Select a standard view, set the up-axis convention, and use mouse shortcuts to rotate, roll, pan, or zoom a model. Use Mechanics Explorer frame highlights and Graphic blocks to visualize frames. Visualization filtering as a means to selectively show and hide solids, bodies, and multibody subsystems in Mechanics Explorer. Use selective model visualization to show only those model components that are relevant to you. Use Mechanics Explorer to go to the block corresponding to a tree view pane node. Use Camera Manager to create or edit a model visualization camera with a moving viewpoint. Distinction between dynamic cameras and the global camera. Camera Manager as a tool for creating dynamic cameras. Dynamic camera keyframe and tracking modes. Save an animation in video format using Video Creator or the smwritevideo function. Review how model animations work and explore the basic controls available for animations. 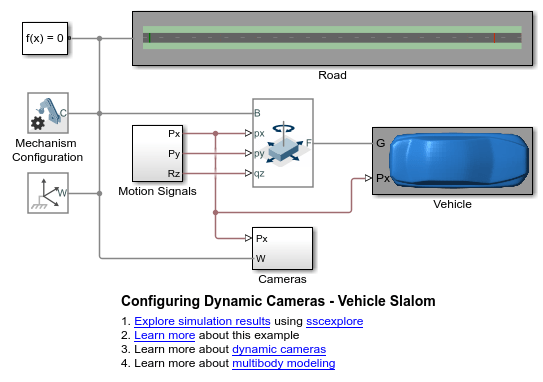 Illustrates the use of dynamic cameras to view a vehicle traversing a slalom course. The vehicle accelerates from stationary to a fixed speed and then enters the slalom course. Upon exiting, the vehicle decelerates back to stationary before the end of the road. The model has four dynamic cameras: three with tracking parameterization and one with keyframes. The tracking cameras show the front and side views of the vehicle from a fixed offset relative to the vehicle, along with the view from the driver's perspective. The keyframed camera shows a sweeping view of the vehicle maneuver. 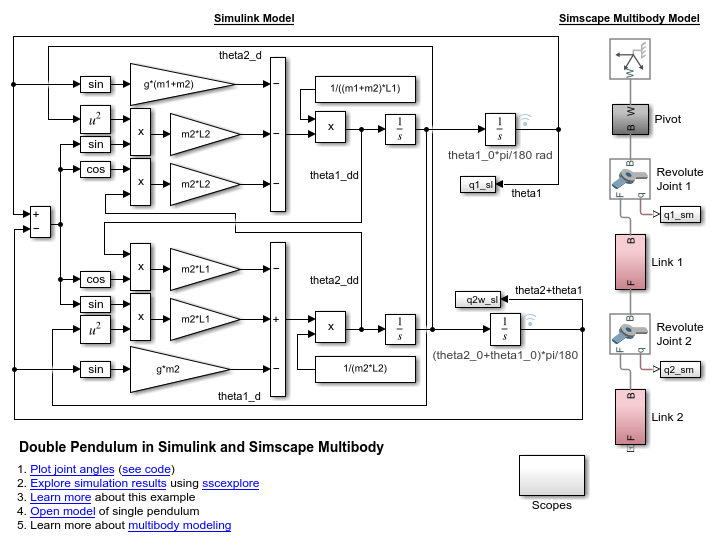 A single pendulum modeled using Simulink® input/output blocks and using Simscape™ Multibody™. The initial angle for the joint is defined by a MATLAB® variable. The annotations on the integrator block show the initial angle of the joint with respect to the world frame. 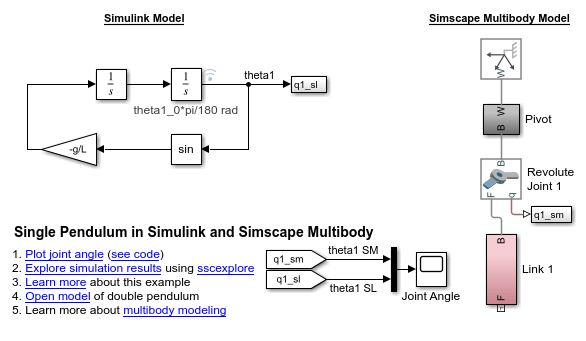 Two models of a double pendulum, one using Simulink® input/output blocks and one using Simscape™ Multibody™.